Worcestershire captain Daryl Mitchell says that they must learn their lessons from this week's three-day County Championship defeat by Yorkshire. The promoted 2014 Division Two runners-up got a rude awakening against the supposedly weakened county champions, being bowled out for just 100 on the third day to lose by 10 wickets. "We have to find a way of handling it," Mitchell told BBC Sport. "The way Yorkshire bowled in that third innings was outstanding." Worcestershire now head, without England's Moeen Ali, for Hove to play Sussex in their second Championship game of the season, starting on Sunday. And Steve Rhodes' side will be looking to improve on a poor record against a county who did not win the title for the first time until 2003 but have done so twice more since. "We have to learn our lessons," added Mitchell, who made a half century when he faced Yorkshire playing in the MCC v champion county game in Abu Dhabi last month. "We've got 15 games to go. We have to go out to try and win every one of them while knowing that, if we win four or five, then we'll be some way to avoiding relegation. "We competed really well for two days against Yorkshire. We've just got to do it over four days. We batted well to get a first-innings lead and we had opportunities to bowl them out for less. "But there were a lot of positives to take, like the way Tom Fell batted and the way Gareth Andrew and Jack Shantry bowled. 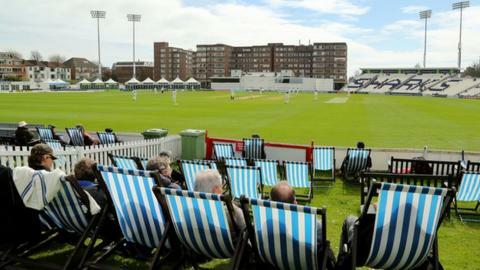 "Moving forward to Hove, we need to find a batter as Moeen Ali has gone to link up with the England tour party. "It will most likely be Alexei Kervezee, and Joe Leach was unlucky to miss out for the first game." Worcestershire (from): D K H Mitchell (capt), R K Oliver, T C Fell, A P R Gidman, T Kohler-Cadmore, A N Kervezee, O B Cox, G M Andrew, J D Shantry, C A J Morris, S M S M Senanayake, J Leach.